The global diesel engine market was worth US$ 215 Billion in 2018. The global diesel engine market is currently witnessing healthy growth. The diesel engine is an internal combustion machine in which the air is compressed inside a cylindrical vessel to ignite the fuel. It changes the chemical energy stored in the fuel into mechanical energy which is used to power freight trucks, locomotives, large vessels, vehicles, etc. Currently, two types of diesel engines are available in the market. Two-stroke engines that complete a power cycle with two strokes of the piston during one crankshaft revolution, and four-stroke engines that complete the cycle with four separate strokes by turning the crankshaft. Diesel engines are capable of offering better operational performance and higher fuel economy, making them increasingly preferred among the end-users. A key factor driving the demand of diesel engines is the fact that they provide better fuel efficiency compared to petrol engines and are extremely popular in commercial and heavy-duty vehicles. Moreover, the strong growth of the automobile industry, particularly in emerging markets such as India, China, Vietnam, etc. is also expected to create a positive impact on the demand of diesel engines. 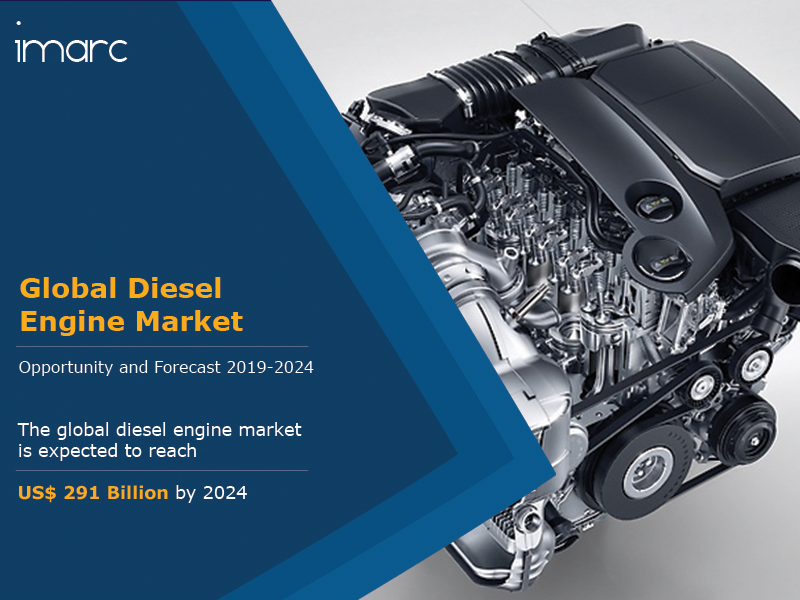 Apart from this, growth in the non-automotive diesel engine market is also expected to catalyse the market with growth expected to be driven by rising energy demands from infrastructure growth and the manufacturing industry. Strong industrialization in developing economies has also increased the demand of diesel engines driven by an increasing requirement for a reliable and consistent source of power generation to ensure uninterrupted and efficient operations. Looking forward, IMARC Group expects the market to reach a value of US$ 291 Billion by 2024, exhibiting a CAGR of around 5% during 2019-2024. The report has also analysed the competitive landscape of the market with some of the key players being ACGO Corporation, China FAW Group, Bosch, Deere & Company, Continental AG, Delphi Automotive, Mitsubishi Heavy Industries, Ford Motor, General Motors, MAN SE, Wärtsilä, Cummins, Caterpillar, Rolls-Royce, etc.